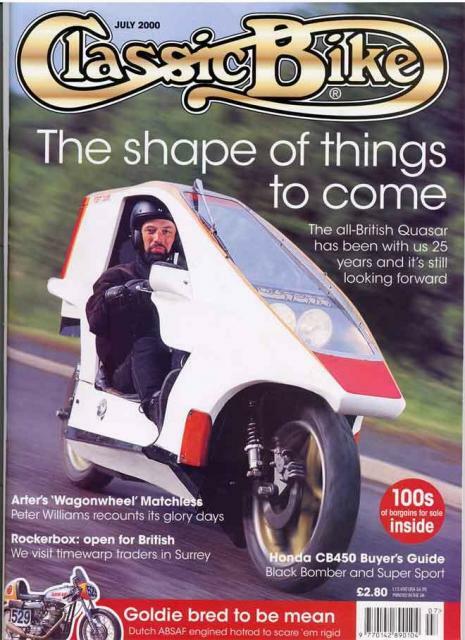 I wrote an 8 page feature about the whole history of the Quasar for the July 2000 issue of Classic Bike magazine. This splendid Phil Masters action shot of Mark Crowson in his white machine graced the cover. Phil Read also talked about his liking for the Quasar in his monthly column in the same issue which was illustrated with the famous photo of him in top hat and tails with the Quasar that he rode to Buckingham Palace to pick up his MBE back in the mid-70s. PNB.